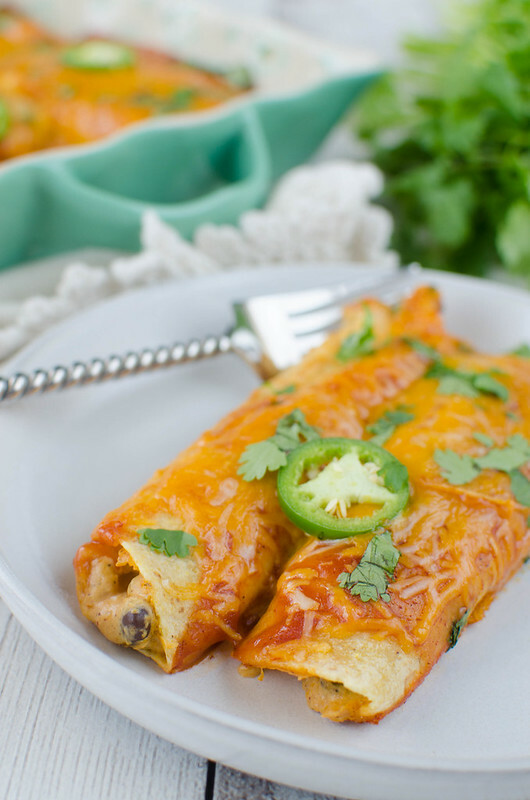 Butternut Squash and Black Bean Enchiladas – easy and delicious meatless meal! A little bit spicy, a little bit sweet. The whole family will love this recipe! I couldn’t wait any longer. Plus, I kinda feel like butternut squash has become more acceptable all year. I buy spiralized butternut squash every week of my life. So yeah, we’re going with squash in July. Plus, Texas has been so miserably hot this summer that I’m actually ready for fall. I’m never ready for summer to end so you know it’s bad. This is a really, really old blog post (like, 2011) that has been needing a makeover since the day I published it. It’s one of my favorite recipes on the blog but the photos were so bad and they were horizontal and it was just terrible. But I wasn’t sure if my kids would eat it and I can’t eat an entire pan of butternut squash and black bean enchiladas by myself. I mean, I probably could but I probably shouldn’t. But my oldest – I think I’ve mentioned this – won’t eat meat these days (and don’t say, “Oh, he’s a vegetarian?” because no, he’ll happily eat a chicken nugget or a hot dog but won’t go near ground turkey. can you feel my eyeroll in that sentence?) so I’ve been trying to do more meals with beans. So it’s mashed butternut squash (I cube, boil, and then mash with my stand mixer) mixed with cream cheese, chili powder and cumin, enchilada sauce, cheese, and the black beans. That’s rolled into corn tortillas and then you put more enchilada sauce and cheese on top. And bake until bubbly. It’s actually a really quick meal to put together, especially if you go ahead and prep the butternut squash in advance. We had no leftovers. My kids won’t eat squash in it’s original form but I’ve found mixing it into things always goes over well. 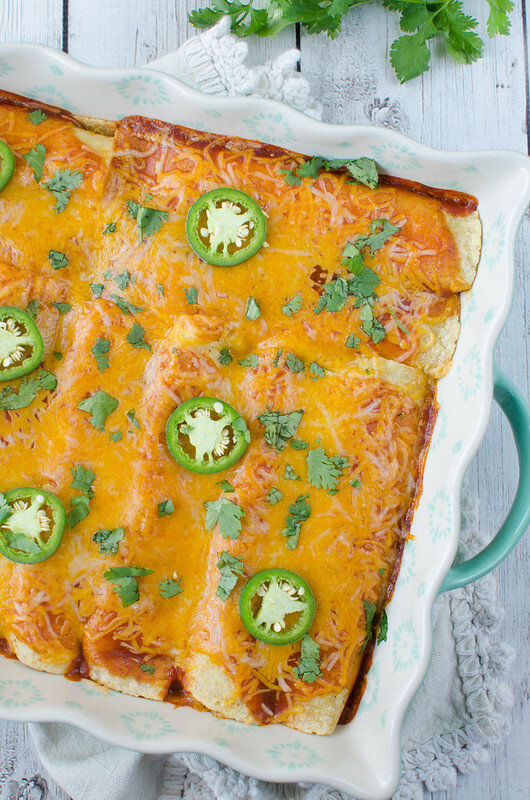 It adds just a hint of sweetness which works really well in something a little bit spicy, like these enchiladas. Bacon and Butternut Squash Breakfast Tacos – corn tortillas with a butternut squash and bacon filling. Top with an egg for the perfect breakfast taco! Sweet Potato and Butternut Squash Hash – healthy breakfast idea! Autumn Squash Soup – Panera copycat recipe! It’s vegetarian and full of butternut squash and pumpkin. Preheat the oven to 375F and spray a large rectangular baking dish with cooking spray. In a large mixing bowl, combine the butternut squash and cream cheese until well-mixed. Stir in spices, garlic, jalapenos and black beans. Add in half a cup of the enchilada sauce and 1 cup of the cheese. Place a generous amount of filling in each tortilla and roll tightly (warm the tortillas to make rolling easier if you need to). Place in baking dish and pour remaining enchilada sauce over the top. Sprinkle with remaining 1 cup of cheese. Bake, uncovered, 10 - 15 minutes, until bubbly. 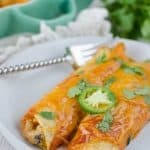 8 Responses to "Butternut Squash and Black Bean Enchiladas"
These sound right up my alley. I love butternut squash. Love this dish! Oh yum! I made burritos with sweet potato for the first time this year and everyone loved them. But weren’t near as awesome as these! Wow! I wish my husband would expand his horizons and learn to eat things like this! I really can’t justify an entire pan of them only for me, but I really, really want to try them. These look amazing! Love everything about them. I loved these SO MUCH, and I’m glad your family did too. 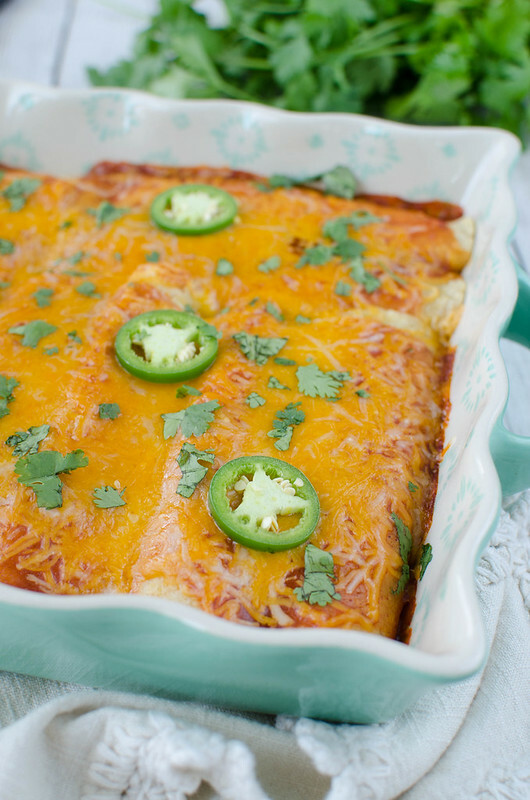 Who would have thought, butternut squash in an enchilada? These definitely look good. I enjoy seeing butternut squash sneaking back in because I am still loving it since the fall. Yum, butternut squash! This sounds so delicious. I featured this recipe on my weekly What to Cook Wednesday post. I hope you will stop by and check it out!